I am so excited about this little baby! 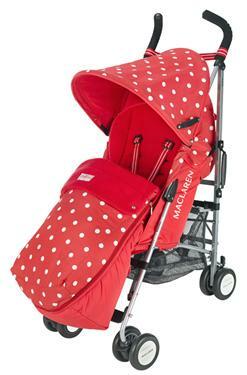 It's the limited edition Maclaren Cath Kidston Stroller in red with white polka dots! Aaahhh! Love love love!!! We initially bought a Phil & Teds Dash while I was pregnant. We've had a few issues with it (ok, they had to send us a whole new one because ours was from a batch where they all had faulty front wheels) but on the whole it's been a pretty good pushchair. But while we were planning our trip away, I read as much info I could on traveling with a one year old and everyone said that an umbrella pushchair was the way to go for size and convenience. We bought a very cheap one to take away and it was great. I really appreciated the compactness of it. We never would have been able to maneuver the Phils & Teds around all the malls and shops the way we did with the umbrella stroller. It didn't recline backwards so when poor Maddy tried to nod off her head kept rolling forward and waking her up. The bottom strap of the five point harness was too far down the seat so she kept slipping down and slouching forward which made her look incredibly uncomfortable - although she never moaned about it. The handles weren't padded so your hands got sore after a while. When we got home our Phil & Teds felt huge in comparison so I thought there had to be a happy medium between the two - enter the Maclaren Cath Kidston Quest. I have literally taken it out of the box, read the essentials on opening and closing it and now am waiting for Maddy to wake up from her afternoon sleep so we can test drive it. It looks SO comfy. It even comes with a fleecy lined foot muff to keep her snuggley. I love this pushchair, it is so gorgeous and just perfect for a little girl ! Have you seen Cath Kidston's New Maclaren Pushchair? I just discovered it yesterday and now I'm obsessed. Cath Kidston knows how to make perfect buggies for little angels. Gasp! (That is the sound of the quick intake of air that I made when I opened your link). Isn't it gorgeous! I had no idea they were releasing this! It's so pretty. I see the Maclaren Quest has also been released in a rainbow stripe as well in conjunction with Dylan Laurens Candy Bar too. It's so great to see so many colours and prints being used. I possess two new grandchildren which would come in very helpful for me!